As I wrote a few years ago, there was a sizable portion of the animated programs that ran on Kids WB that had yet to see a home video release. (“Kids WB” was the children’s programming arm of The WB, now The CW.) However, since that time, enough’s changed (via the Warner Archive program, Netflix, the rise of digital video, etc.) that I thought it merited a newer, updated post. So which of the classic animated Kids’ WB shows, in part or in whole, still aren’t available on DVD, streaming, or digital video? For simplicity (and since it was the bulk of programming), I’m just looking at the shows made by Warner Animation itself. For shows like “Men in Black: TAS” or “Jackie Chan Adventures,” try their Wikipedia pages. Tiny Toon Adventures: The entire run of the original series is on DVD, save the two specials that wrapped up the show’s run: “Night Ghoulery” and a “Spring Break” special. However, “Tiny Toons” is still broadcast on TV on Discovery Family (formerly The Hub). It’s also where I saw the “Night Ghoulery” special a few years ago on Halloween. Taz-Mania: The Tasmanian Devil’s early 90s series had its first 26 (out of 65) episodes released to DVD in 2013, on two separate DVD sets. Histeria! : This series is completely unavailable on DVD, streaming video, or iTunes/Amazon/etc. I suspect being an “E/I” educational show might make the chances of a DVD release slim. However, there’s always the Warner Archive. Sylvester and Tweety Mysteries: The show’s first 13 episodes were released to a DVD set several years ago, but nothing since. At 13 episodes per set, it’d need another three sets to finish its run. Mucha Lucha! : The show’s only had a few episodes released to a single DVD, plus a direct-to-DVD movie. 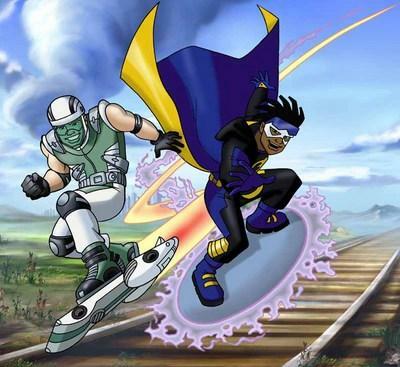 Static Shock: Despite the show’s popularity, there’s only a single DVD release of a few episodes available, plus the first season available digitally from Amazon. Detention: This short-lived 13-episode late 90s series was mostly a knockoff of “Recess,” about a group of mischievous kids and their drill sergeant-like teacher. It’s yet to have any sort of home video release. Ozzy & Drix: A spinoff of the movie “Osmosis Jones,” this series aired for 26 episodes across two seasons. It hasn’t appeared on any home video release since its run. Coconut Fred’s Fruit Salad Island: This show was easily (in my opinion) one of the worst cartoons ever made. A shabby attempt at ripping off “SpongeBob SquarePants”‘s success. It hasn’t been seen anywhere since leaving the air. Waynehead: An early Kids’ WB series loosely based on the childhood of Damon Wayans, this show ran for 13 episodes. It’s yet to appear on home video. Johnny Test: One of the last remnants of Kids WB’s run. Over the years, the show’s changed animation studios and networks. The first 65 episodes of the show are available on DVD. Meanwhile, the first 91 episodes available are available on Netflix. As of this writing, “Johnny Test” has had 130 episodes produced. Shaggy & Scooby-Doo Get a Clue! : While only two DVDs (with a handful of episodes) were released, both seasons are available on Amazon and iTunes. The Legion of Super-Heroes: The first season is available on DVD and digital video, but not the second. The Zeta Project: Like “Legion,” only the first season’s available on DVD/digital video, but not its second season. Xiaolin Showdown: Only the first season is available on DVD. Krypto the Superdog: A handful of episodes were released to DVD. The 26 episode first season is available digitally from Amazon, but not the 13 episode final season.